Hello and welcome to the 101st installment of the SWD. Syrian Arab Army continued operations against Islamic State in eastern Aleppo countryside capturing several localities. Captured localities are Al-Batoushiyah, Al-Salihiyah, Jubab Masudiyah Kabir, Jubab Masudiyah Saghir and Al-Shumariyah. Amaq Agency claimed destruction of SAA‘s ZSU-23-4 Shilka and two machine gun positions south of Jirah Air Base. Several pro-government sources reported the death of Islamic State’s “Minister of War” Abu Musab al-Masri during the SAA‘s operation in eastern Aleppo, info was later picked up by a couple of mainstream media outlets. The claim about Abu Musab being IS’ “Minister of War” is incorrect, as the position is currently officially vacant due to fears of the selected individual being targeted by CJTF-OIR, but Tajik national Gulmurod Khalimov has been unofficially appointed as the minister. Even though these reports about the death of Abu Musab are being exaggerated and used as a propaganda, Islamic State did suffer a loss with the death of Abu Musab. Abu Musab al-Masri from Egypt was one of the numerous foreign IS’ commanders. Clashes between Jabhat al-Shamiya and Faylaq al-Sham have spread to Azaz as fighting is raging over the southern neighborhoods of Azaz. Operation is reportedly aimed at removing Hayat Tahrir al-Sham’s influence in northern Aleppo, the reason Faylaq al-Sham is getting targeted has already been stated. Members of Nour al-Din al-Zenki, part of Hayaat Tahrir al-Sham, have formed Liwa Fursan al-Thawra in northern Aleppo and then joined Faylaq al-Sham. Clashes have also been reported in Al-Bab between the aforementioned groups. Islamic State launched a night raid on three SAA‘s checkpoints on Ithriya – Khanaser road. According to Amaq’s statement, 11 soldiers belonging to SAA were killed and one vehicle destroyed. Pro-government sources reported attack was repelled, but SAA lost four soldiers according to them. Syrian Democratic Forces captured Hamrat Nasir after more than three days of clashing with Islamic State in and around it. Another locality captured today by SDF is Hamrat Balasim, southeast of Hamrat Nasir. Islamic State’s attack on Baran village was repelled with SDF reportedly destroying seven SVBIEDs. Amag Agency released a new video showing four captured SDF soldiers, they were captured in the village of Eajil near Tabqa Air Base. Syrian Democratic Forces will reportedly rename currently IS-held Baath dam to Freedom Dam (Arabic: Sadd al-Harriyah, Kurmanji: Azadi Dam) once they capture it. 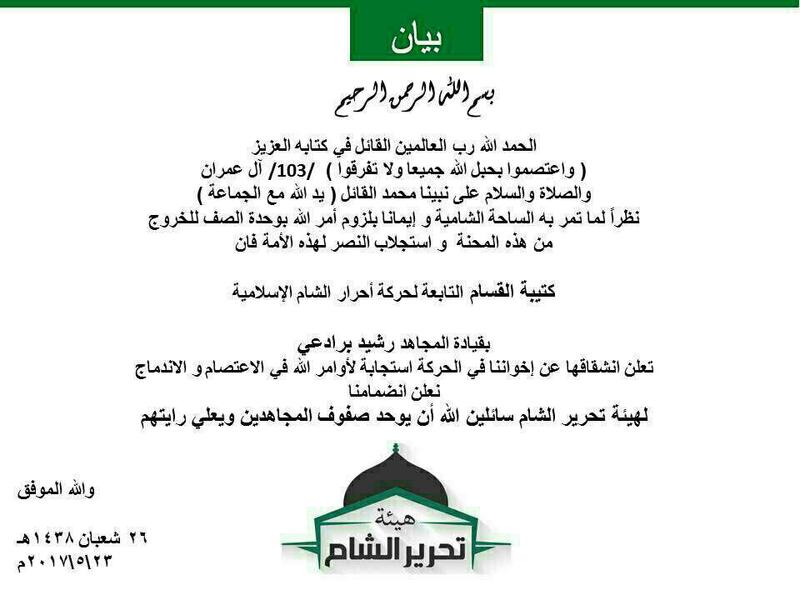 Hayat Tahrir al-Sham released a statement about Katibat al-Qassem defecting from Ahrar al-Sham and joining Hayat Tahrir al-Sham. Rashid Baradaei is the leader of Katibat al-Qassem. Two days ago, unknown gunmen assassinated commander of Liwa Farouq Homs in Maasaran, northeast of Maarat al-Numaan. Syrian Arab Army reportedly advanced east of Palmyra and captured several hills close to Arak giving them fire control over both Arak and surrounding oil/gas fields. Relevant statement from Amaq Agency reported the death of 12 SAA‘s soldiers and destruction of two vehicles east of Palmyra silos. South of Palmyra, Syrian Arab Army captured Tell al-Farri and missile battalion as well as Bir Qasr al-Hallabat south of which SAA already advanced on the 19th of May. After these advances, SAA units south of Palmyra are a step closer to linking up with those advancing east of Al-Qaryatayn. If those two fronts were to link up, a sizeable Islamic State’s pocket of mountains would be created. Several sources, mainly pro-rebel reported about a large Islamic State attack against SAA in Deir al-Zour. According to the reports, Islamic State advanced in Huwayqa al-Gharbi capturing Jawrah bridge, Naqshabandi, Anas ibn Malik mosque and Kasar district. IS’ advances should be taken with a grain of salt until confirmed by official channels and/or its media outlet, Amaq Agency. Rebels’ operations room Al-Bunyan al-Marsous reportedly advanced in the northern edges of Al-Manashiyah after failed SAA‘s attack on the 22nd of May. Rebels captured around 40 buildings in northeastern Al-Manashiyah district. Commander of Jaysh al-Muetazz Billlah, Abdul Malik Al-Homsi was assasinated in Tafas, north of Daraa. Jaysh al-Muetazz Billlah is a part of Free Syrian Army’s Southern Front. Situation in Al-Manashiyah according to Al-Bunyan al-Marsous operations room (light blue = newly captured). Based on a number of Amaq Agency’s statements coming from west Mosul, Islamic State had a “successful” day in the area, fending off several attacks and actually recapturing some ground from the Iraqi forces. 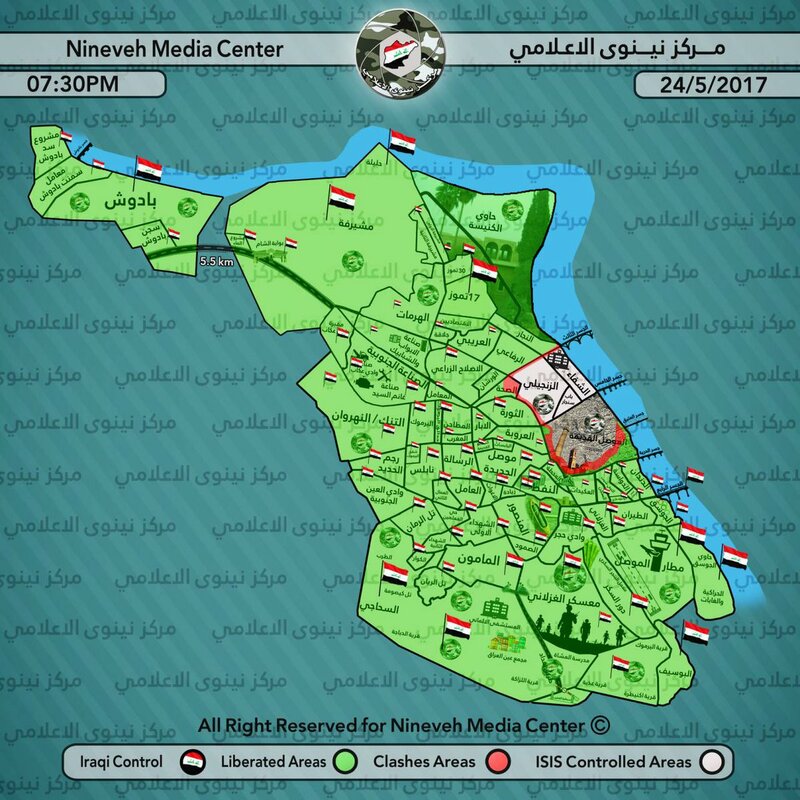 IS’ main attack happened in Al-Najar district allegedly resulting in the recapture of many positions inside the district as well as causing several casualties among the Iraqi Special Operations Forces’ ranks. Also in Al-Najar district, IS claimed to have damaged a Humvee and killed a member of Iraqi Special Operations Forces. In Al-Rifai IS reportedly once again caused casualties among the Iraqi Special Operations Forces’ ranks by killing six members. The last, remaining statement from Amaq Agency reported IS’ snipers killed five Iraqi soldiers during clashes in Al-Thawra district and in Bab al-Toub neighborhood, Old Mosul district. Kurdistan Democratic Party’s Asayish (security forces) reportedly arrested Yazidi cleric Fakhir Khilmatikar who visited Yazidi branch of Liwa al-Hussein, part of Al-Hashd al-Shaab on the 19th of May. This act by Asayish will only worsen already strained relations between Kurdistan Democratic Party and Yazidi community in KDP-held areas in Iraq. Deputy Chairman of Popular Mobilization Committee Abu Mahdi al-Muhandis officially launched the second phase of operations west of Mosul in Nineveh desert. Aim of the second phase is to capture IS’ stronghold of Baaj and secure the northern part of the border between Syria and Iraq. Even though the start of the second phase was announced during the night, Al-Hashd al-Shaabi have already started to heavily shell IS-held localities and stormed the village of Al-Qahtaniya. Another explosion has struck area east of Rutbah, this time IS’ improvised explosive destroyed Iraqi Army’s Humvee killing everyone on board in Kilo 160 area, according to Amaq Agency. On the 20th of May, an improvised explosive device exploded in Kilo 110 area. positions and a mortar system. Other area where one strike occurred is Abu Kamal damaging a vehicle. Full report on CJTF-OIR strikes conducted in both Syria & Iraq can be found here.